It's almost impossible to perfectly predict the weekend box office grosses, and more often than not, some movies manage to come in either far above, or far below expectations. A few days ago, we predicted that the animated comedy The Boss Baby would have a solid weekend with just over $20 million, but this animated comedy managed to far exceed expectations, dethroning two-time winner Beauty and the Beast and taking the box office crown with $49 million. This came in just above Beauty and the Beast's third weekend tally of $47.5 million, bringing its domestic take to $395.4 million, with $876.2 million worldwide, inching closer and closer to the $1 billion mark. Box Office Mojo reports that The Boss Baby earned an impressive $12,987 per-screen average from 3,773 theaters while the Ghost in the Shell adaptation debuted in 3,440 theaters, taking third place with $19 million with a decent $5,523 per-screen average. While those are both solid theater count numbers for an opening weekend, Beauty and the Beast remained in 4,210 theaters this weekend, 1,000 more than Ghost in the Shell and 500 more than The Boss Baby, although it dropped 47.4% to second place with an impressive $47.5 million. As far as these new releases' critical receptions, The Boss Baby rose from 29% on Rotten Tomatoes to 49%, although it's still not exactly a positive score. Ghost in the Shell is currently at 42% on RT. The top 5 rounded out by Power Rangers ($14.5 million) and Kong: Skull Island ($8.8 million). Disney's Beauty and the Beast very well could be the first box office blockbuster of the year to surpass $1 billion worldwide, which seems likely to happen sometime this week, or perhaps next week. If that happens, it will be the 29th movie in box office history to do so, and the 14th Disney movie to surpass this box office milestone. With highly-anticipated movies like Guardians of the Galaxy Vol. 2 (May 5), Pirates of the Caribbean: Dead Men Tell No Tales (May 26), Cars 3 (June 16), Thor: Ragnarok (November 3), Coco (November 22) and Star Wars: The Last Jedi (December 15), this could end up being a record-shattering year for Disney at the box office. When the brother of a fast-talking briefcase-carrying baby (voiced by Alec Baldwin) embarks on a mission to win back the sole affection of his parents, he stumbles upon a secret plot by the CEO of Puppy Co. (voiced by Steve Buscemi) that threatens to destroy the balance of love in the world, and this brash baby executive masquerading as his new brother is at the center of it all in DreamWorks Animation's The Boss Baby. Now, they must come together as true brothers to stop the dastardly scheme, save their parents, restore order to the world, and prove that love is indeed an infinite force. 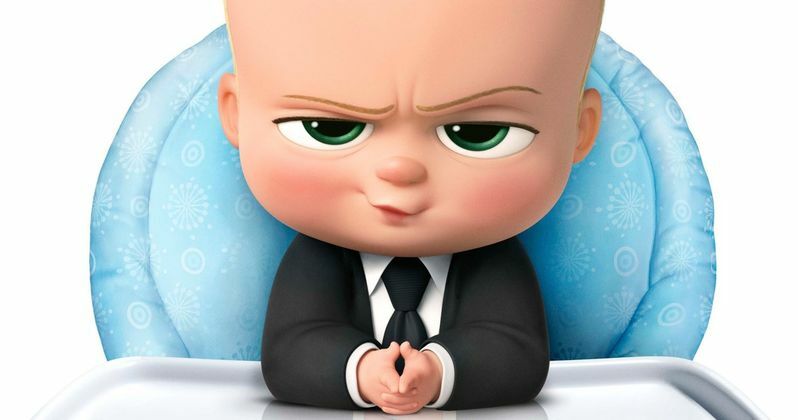 The Boss Baby voice cast is rounded out by Lisa Kudrow, Tobey Maguire, Jimmy Kimmel, ViviAnn Lee and Miles Christopher Bakshi. In the near future, Major (Scarlett Johansson) is the first of her kind: A human saved from a terrible crash, who is cyber-enhanced to be a perfect soldier devoted to stopping the world's most dangerous criminals. When terrorism reaches a new level that includes the ability to hack into people's minds and control them, Major is uniquely qualified to stop it. As she prepares to face a new enemy, Major discovers that she has been lied to: her life was not saved, it was stolen. She will stop at nothing to recover her past, find out who did this to her and stop them before they do it to others. Based on the internationally acclaimed Japanese Manga, "The Ghost in the Shell." The supporting cast includes Pilou Asbaek, Sam Riley, Michael Pitt, Christopher Obi and Takeshi Kitano. The top 10 is rounded out by Logan ($6.2 million), Get Out ($5.8 million), Life ($4.6 million), CHiPs ($4 million) and The Zookeeper's Wife ($3.3 million). Also opening in limited release are a re-release of Donnie Darko, which earned $53,200 from 21 theaters for a $2,533 per-screen average, and The Devotion of Suspect X, which earned $330,000 from 43 theaters for a $7,674 per-screen average. No box office data was released for The Blackcoat's Daughter, Carrie Pilby, Here Alone, Despite the Falling Snow, Here Alone, Live Cargo, God Knows Where I Am, The Prison and Naam Shabana. It remains to be seen if any of these films will expand in the weeks and months ahead. Looking ahead to next weekend, three new films will open in wide release, with Sony's Smurfs: The Lost Village going up against Warner Bros.' comedy remake Going in Style and PureFlix's The Case For Christ. Also debuting in limited release are Magnolia's Alive and Kicking and Cezanne et moi, Neon's Colossal, Parade Deck's The Eyes, Fox Searchlight's Gifted, IFC's Graduation, Well Go USA's Mine, STX Entertainment's Their Finest, Shout! Factor's The Ticket, FilmRise's Truman Screen Media's The Void and Funimation's Your Name. Check back on Sunday for the box office estimates, and again next Tuesday for our next round of predictions. Until then, take a look at our projections for the weekend of March 31.